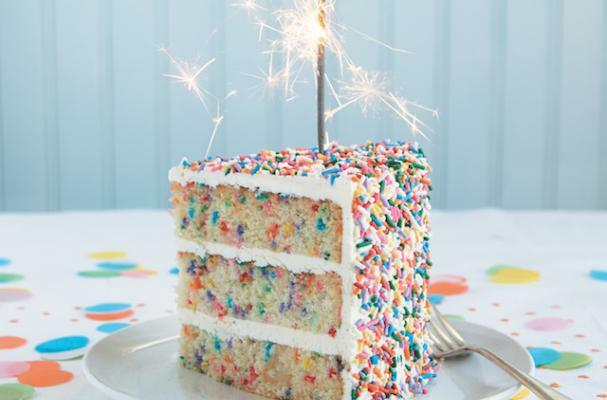 You can never go wrong with a vanilla layer cake especially if it's covered in sprinkles and the recipe is from Matt Lewis and Renato Poliafito of Baked Occasions. These two dudes know how to make a dynamite dessert. While this cake was originally made to be served on birthdays, it will stand out on any occasion. Furthermore, you can coordinate the sprinkles to match the holiday or event where your three tiered vanilla cake will be making an appearance. At first, Baked was just an idea—a grand vision of thick cake slices, giant cups of coffee, and endless slabs of fudge-like brownies—gestating and evolving for several years in Renato’s and my collective mind. It was a sweeping, swirling, and ambitious dream that lived inside us—alongside us. We ate a lot of cake. We drank a lot of coffee. By turns gradually and impulsively, we honed the concept. First, we fell in love with a neighborhood: Red Hook, Brooklyn. It is the kind of neighborhood that doesn’t much exist in New York City anymore. It is the kind of neighborhood that still feels special, small, local, artistic, unusual, and, most important, neighborly. Then, we fell in love with a space that needed a lot of love. Thankfully it was in the heart of Red Hook, on the heart of Van Brunt Street. In the summer of 2004 we set about piecing together our physical bakery. Slowly (perhaps much too slowly), the form began to take shape. After several months of nonstop mania, tears, exhaustion, and small triumphs, we proudly birthed our baby. Baked opened to the public on January 1, 2005. We mark the occasion of our store opening, aka Baked’s Birthday, every year. We usually do so with a lot of cake. We hope you will celebrate this happy occasion with us by making this cake. This is a very happy cake. This is the kind of birthday cake that turns gray skies blue; it is also very, very tasty. Obviously, our Very Vanilla Sprinkle Cake is full of vanilla. Vanilla is often the more stately, less sinful sister to our beloved chocolate, but it is just as powerful and enchanting in larger-than-average doses. We liberally applied vanilla to both the light white sponge cake and the smooth, rich frosting. Then—because we absolutely couldn’t help ourselves—we filled and covered the whole cake with a rainbow explosion of sprinkles. The visual effect is a bit ridiculous and absolutely necessary. Baked note If you like to decorate cakes, you might want to invest in a sturdy cake turntable (see page 15). While you don’t absolutely need one, it will certainly help to achieve smooth cakes, special swirls, and, well . . . it makes adding the sprinkles to this cake a whole lot more fun. 1. Preheat the oven to 325°F (165°C). Butter three 8-inch (20-cm) round cake pans, line the bottoms with parchment paper, and butter the parchment. Dust with flour and knock out the excess flour. 2. Sift both flours, the baking powder, baking soda, and salt together into a large bowl. Set aside. 3. In the bowl of a standing mixer fitted with the paddle attachment, beat the butter and shortening on medium speed until creamy, 3 to 4 minutes. Add the sugar and vanilla and beat on medium speed until fluffy, about 3 minutes. Scrape down the bowl, add the egg, and beat until just combined. 4. In a small bowl, whisk together the ice-cold water, milk, and buttermilk. 5. Add the flour mixture to the mixer bowl in three separate additions, alternating with the water mixture, beginning and ending with the flour mixture; turn the mixer to low when you add the ingredients, then up to medium for a few seconds to incorporate. Scrape down the bowl, then mix on low speed for a few more seconds. Remove the bowl from the standing mixer, scatter the sprinkles across the top of the batter, and fold them in with a rubber spatula. 2. Transfer the mixture to the bowl of a standing mixer fitted with the paddle attachment. Beat on high speed until cool, at least 7 to 9 minutes (you can speed up the process by pressing bags of frozen berries or corn against the sides and bottom of the mixing bowl). Reduce the speed to low and add the butter a few chunks at a time, every 20 to 30 seconds, while the mixer is constantly stirring; mix until thoroughly incorporated. Increase the speed to medium-high and beat until the frosting is light and fluffy, 1 to 2 minutes. Add the vanilla paste and extract and mix until combined. If the frosting is too soft, place the bowl in the refrigerator to chill slightly, then beat again until it can hold its shape. If the frosting is too firm, set the bowl over a pot of simmering water and beat with a wooden spoon until it is spreadable. 1. Place one cooled cake layer on a cake turntable (or a serving platter if you don’t own a cake turntable). Trim the top to create a flat surface, and evenly spread about 1 1/4 cups (215 g) of the frosting on top. Add the next layer, trim it, and frost it as before, then add the third layer (trim the final layer for a completely flat top, or feel free to leave it domed for an old-school appearance). Spread a very thin layer of frosting over the sides and top of the cake and place it in the refrigerator for about 15 minutes to firm up. (This is known as crumb coating and will help to keep loose cake crumbs under control when you frost the outside of the cake). 2. Place the turntable on a parchment-lined baking sheet with raised sides. Frost the sides and top with the remaining frosting. Grab a fistful of sprinkles and turn the turntable with your free hand while tossing the sprinkles at the sides of the cake. Using the leftover sprinkles from the parchment (i.e., sprinkles that didn’t stick), continue turning and throwing until the cake (including the top) is covered in sprinkles. Chill the cake for about 5 minutes to set before serving. How to store This cake will keep beautifully in a cake saver at room temperature (cool and humidity-free) for up to 3 days. If your room is not cool, place the cake in a cake saver and refrigerate for up to 3 days, then let it sit at room temperature for at least 2 hours before serving.